The Chevrolet Monte Carlo is a two-door coupe manufactured and marketed by Chevrolet from 1970 to 2007 model years (non-continuously), encompassing six generations. Chevrolet marketed the Monte Carlo as a personal luxury car, with the last generation classified as a full-sized coupé. The first four generations of the Monte Carlo (1970–1972, 1973–1977, 1978–1980, and 1981–1988) were of a rear-wheel-drive, V8-powered (a V6 engine from 1978) coupe design, using body-on-frame construction. The later rear-wheel-drive generations did not incorporate the trend of uni-body construction that became more prevalent in the early 1980s as automakers downsized their vehicle lines to satisfy increasing demand for fuel-economy after the 1973 oil crisis and the early 1980s recession. The SS model was reintroduced from mid-1983 to 1988 with a 305 cu in (5.0 L) V8. The car was named for the city Monte Carlo in the Principality of Monaco, specifically the ward of Monte Carlo/Spélugues. After the discontinuation of the rear-drive Monte Carlo after 1988, the nameplate was revived in 1995 for the fifth-generation, a front-drive, V6-powered coupe based on the Chevrolet Lumina sedan. The sixth and final-generation Monte Carlo in 2000 was built alongside the Chevrolet Impala, which succeeded the Lumina as Chevrolet's mid-sized sedan. The Monte Carlo SS was revived from 2000 to 2007, that was initially powered by 3.8 L V6 (supercharged in 2004 and 2005) and by a 5.3 L V8 for 2006 and 2007. For the 1968 model year, GM instituted a split-wheelbase policy for its A-platform intermediate-sized cars. Two-door models would have a 112 in (2,845 mm) wheelbase, 116 in (2,946 mm) for sedans, and 121 in (3,073 mm) for station wagons. In 1969, GM introduced the Pontiac Grand Prix, a two-door that used A-platform layout that was stretched ahead of the firewall to make it 210.2-inch (5,339 mm) long. This gave the design an unusually long hood design helping the new Grand Prix to outsell its larger B-body predecessor, despite higher prices. The new layout was first known as the A-body Special, but would evolve into its own class known as the G-platform. The Monte Carlo started as Chevrolet's version of Pontiac Grand Prix, as conceived by Elliot M. (Pete) Estes, general manager of Chevrolet, and Chevrolet's chief stylist, David Holls. They modeled the styling on the contemporary Cadillac Eldorado, although much of the body and structure were shared with the Chevrolet Chevelle (firewall, windshield, decklid, and rear window were the same). New exterior "coke bottle styling" featured concealed windshield wipers. A light monitoring system was optional. A mid-1990s article in the magazine Chevrolet High Performance stated that the first generation Monte Carlo was known to Chevrolet management under the working name Concours. Usual practice at the time was that all Chevrolet model development names started with a "C". At one point, the proposal called for a formal coupe, sedan, and convertible. It has been noted that the sedan resembled a full-size Oldsmobile 98 prior to the use of the GM G platform with at least one photo showing the pull-up door handles that would be introduced on the 1970½ Camaro and 1971 Vega and full-sized Chevys, but not appear on Monte Carlos until the second-generation model debuted in 1973. When the car debuted for the 1970 model year, the only body style available was the two-door hardtop. Though the Monte Carlo was developed at Chevrolet under the leadership of Pete Estes, it was formally introduced in September 1969 by John Z. DeLorean, who succeeded Estes as Chevrolet's general manager earlier in the year after previously heading the Pontiac division, where he led the development of the Grand Prix. The styling of the 1970 model-year Monte Carlo is distinguished by its chromed rectangular grille having a fine grid pattern of 720 small squares with two horizontal dividers, and centered in it, a chrome and red crest emblem adorned by a Corinthian helmet (commonly referred to as the “knight’s crest”), a thin hood spear with no vertical hood ornament, round headlamps with rounded chrome bezels (which appeared on a prototype 1970 Chevelle front end proposal which was rejected for the 4 headlight design), circular parking lamps inset into the front bumper directly below the headlamps, and tail lights with chrome trim around the perimeter of the lens, only. The standard powertrain was the 350 cu in (5.7 L) Chevrolet "Turbo-Fire" small-block V8 with a two-barrel carburetor, rated at 250 hp (186 kW) (gross) at 4500 rpm and 345 lb·ft (468 Nm) of torque at 2800 rpm, mated to a column-mounted 3-speed Synchro-Mesh manual transmission. Front disc brakes were standard equipment. The dashboard was basically identical to the Chevelle except for fake wood trim, according to Holls a photographic reproduction of the elm trim used by Rolls-Royce, and higher grade nylon (or vinyl) upholstery and deep-twist carpeting were used. Base priced at US$3,123, the Monte Carlo cost $218 more than a comparable Chevelle Malibu. Various options were available. A two-speed Powerglide automatic transmission (on 350 CID engines only), three-speed Turbo-Hydramatic, or a four-speed manual; most Monte Carlos were built with the Turbo-Hydramatic. Variable-ratio power steering, power windows, air conditioning, power seats, "rally" wheels, bucket seats, center console, full instrumentation, and other accessories were also available, bringing the price of a fully equipped Monte Carlo to more than $5,000. Optional engines included the four-barrel carbureted Turbo-Fire 350 CID small block V8, rated at 300 hp (224 kW) at 4800 rpm and 380 lb·ft (515 Nm) at 3200 rpm, the Turbo-Fire 400 (400 CID/6.5 L) with a two-barrel carburetor, rated at 265 hp (198 kW) at 4800 rpm and 400 lb·ft (542 Nm) at 3800 rpm, and the Turbo-Jet 400 (402 CID/6.6 L) with a four-barrel carburetor, rated at 330 hp (246 kW) at 4800 rpm and 410 lb·ft (515 Nm) at 3200 rpm). Note that the two Chevrolet 400 CID V8s offered this year were actually two different designs. The two-barrel carbureted Turbo-Fire 400 was a Small Block Chevrolet V8 engine, similar, but different internally, to the 350, while the Turbo-Jet 400 was a slightly enlarged version of the 396 CID big block V8 and had an actual displacement of 402 CID. The most sporty and powerful option was the Monte Carlo SS 454 package. Priced at $420, it included a standard Turbo-Jet 454 of 454 CID (7.4 L) with a four-barrel carburetor, rated at 360 hp (269 kW) at 4800 rpm. It also included heavy-duty suspension, wider tires, "SS 454" badging, and an automatic load-leveling rear suspension. The Turbo Hydra-Matic three-speed automatic was the only transmission available for this package. The rear axle came standard with a 3.06 ratio but was available in 2.56 and 3.31, although it still cost $222 (£142) extra. Weighing only a bit more than a comparably equipped Chevelle SS 454, the Monte Carlo SS was quite a fast car, although it accounted for less than 3% of Monte Carlos sold in 1970. A labor strike at Chevrolet's Flint, Michigan assembly plant (where most Monte Carlo production was scheduled) during the early months of the 1970 model year immediately following the car's introduction on September 18, 1969 limited overall model-year sales to 159,341; short of the projected 185,000. During those early months, Monte Carlos were in short supply, with full-scale production not happening until February 1970, leaving many would-be buyers disappointed after going to their Chevrolet dealers and finding no Monte Carlos in stock. Once full production was underway, Monte Carlos sold well and often at full list price (usually being ordered with many extra-cost options), making it a profitable model for Chevrolet and its dealership networks. SS 454s, however, did not sell so well in 1970, with only 3,823 of the 1970 Monte Carlos being the most powerful model in the range. Popular Mechanics reported 82% of readers who bought a Monte Carlo got one for the styling, however 10.1% of readers disliked the amount of rear leg room. The 1971 model saw minor styling changes, mostly cosmetic. The headlamp bezels were more of a squircle shape with rectangular front parking lamps. The grille had no horizontal divider and the openings were rectangular-shaped. The hood spear included a stand-up ornament with “Chevrolet” script lettering. The grill emblem featured the year, "1971" in Roman numerals. The trunk lock keyhole had the Monte Carlo Crest surrounding it. The tail lights now had two horizontal and one vertical chrome strips. Inside, the SS model got new "European symbol knobs", and a four-spoke steering wheel became optional. AM/FM stereo radios with 8-track tape players were also optional. Mechanically it was largely unchanged, although the small-block Turbo-Fire 400 two-barrel engine was dropped. Other engines had compression ratios lowered to allow the use of regular leaded, low-lead, or unleaded gasoline, per a GM corporate edict. Engine ratings fell to 245 hp (183 kW) for the base Turbo-Fire 350 CID (5.7 L) two-barrel, 270 hp (201 kW) for the Turbo-Fire 350-4V, and 300 hp (224 kW) for the Turbo-Jet 400. The SS 454 engine was actually raised to a nominal 365 gross hp (272 kW) despite the reduction in compression ratio. This increase in horsepower was a result of the 454 engine using the more aggressive camshaft from the 390 hp 454 used in the 1970 Chevrolet Corvette and full-sized sedans. The SS 454 package would be discontinued after this year following production of only 1,919 units, but the 454 CID V8 engine would remain optional in Monte Carlos through 1975. The reason given for discontinuing the SS was that the Monte Carlo was marketed as a luxury vehicle instead of a muscle car. The SS nameplate would be resurrected 12 years later. Yet, at the same time that the Monte Carlo SS was judged a failure in the marketplace and discontinued, the Monte's reputation as a performance car on the race track was gaining strength because Ford and Chrysler were ending their factory-backed racing support due to declining muscle car sales and the need to divert dollars to meet costly Federal safety and emission regulations (General Motors' official policy had prohibited factory racing efforts since 1963). As factory support ended at Ford and Chrysler, the stock-car racing mantle switched to independent teams and sponsors, who overwhelmingly chose Chevrolets over Ford and Chrysler products due to Chevy's much greater availability and affordability of over-the-counter racing parts through the Chevy dealer network. The Monte Carlo was considered the best suited Chevrolet model for stock car racing by most NASCAR teams due to its 116 in (2,900 mm) wheelbase (only one inch above NASCAR's minimum requirements at that time, the Chevelle 2-doors had a shorter 112-inch wheelbase) and long-hood design which placed the engine further back in the chassis than most other vehicles for better weight traction. Thus the Monte Carlo became Chevy's standard-bearer for NASCAR from 1971 to 1989. Production of the 1971 Monte Carlo got off to a slow start due to a 67-day corporate-wide walkout (labor strike) that coincided with the introduction of the 1971 models in September 1970. This left dealerships with only a small shipment of 1971 models (built before the strike) in stock until the strike was settled in mid-November 1970, and then slow-going in reaching normal production levels until around January 1, 1971. Model-year production ended at 128,600 including the 1,919 SS models. A total of 12 1971 Monte Carlo's were shipped to Australia in 1971 and converted to RH drive, 4 of these were SS models from the 1,919 produced. A Cadillac-like egg-crate grille similar to the 1971 Chevrolet Caprice, rectangular front parking lamps moved to the left and right edges of the grille, a wider hood spear without stand-up ornament, and a metal rear trim molding highlighted the changes to the 1972 Monte Carlo, the final year for the first generation design. The SS was dropped, but a new Monte Carlo Custom option appeared as a one-year only offering that included a special suspension and other items previously included with the SS option. Unlike the departed SS package, it was available with any engine on the roster. The Monte Carlo Custom badging was similar to the Impala Custom. In California, which had emissions standards more stringent than federal law, the 4-barrel carbureted 350 was the standard and only available engine. Also, the only transmission offered in California was the Turbo Hydramatic. For 1972, the four-speed manual transmission was discontinued from the option list as a line in the Monte Carlo brochure describing its market position as a personal luxury car stated "Sorry, no four-on-the-floor." The standard three-speed manual and optional two-speed Powerglide automatic transmissions were offered only with the base 350 CID two-barrel engine, with the three-speed Turbo Hydramatic also available with this engine and a mandatory option with each of the optional engines. Mechanically, the most significant change was that variable-ratio power steering became standard equipment for the first time. Interior trim was relatively unchanged from 1971 other than the availability of all-vinyl upholstery with the standard bench seat in addition to the optional Strato bucket seats. Cloth interiors were also offered with both bench and bucket seats. The 1972 model year's production increased to 180,819 to set a new record in the final year for the first-generation A-body. Monte Carlo and other Chevrolet models were promoted as part of a new ad campaign in which Chevys in print and broadcast ads were featured at various tourist attractions and sites around the United States under the tagline "Chevrolet: Building a Better Way To See The USA." A redesigned Monte Carlo was introduced alongside other GM intermediates. Like other GM mid-size cars, the 1973 Monte Carlo was no longer a hardtop, but a pillared coupe with rear side opera windows and frameless door glass. Prominent styling features included an egg-crate grille with a Monte Carlo emblem in front and vertical taillights above the bumper. The front bumper was a large federally mandated 5 mph (8.0 km/h) bumper that was among the required 1973 federal safety standards for all passenger cars sold in the U.S. with the 5 mph (8.0 km/h) requirement extended to rear bumpers on 1974 models. Also new was a double-shell roof for improved noise reduction and rollover protection along with the flush-mounted pull-up exterior door handles first introduced on the 1970½ Camaro and 1971 full-sized Chevrolets and Vegas. The separate body-on-frame construction carried over for 1973, as was the basic all-coil suspension. For improved ride and handling, the 1973 Monte Carlo featured a number of innovations (for a large American car) such as standard radial-ply tires, Pliacell shock absorbers, high-caster steering, and front and rear anti-roll bars (previously offered only with the SS package). The standard Monte Carlo with manual transmission, retained "traditional" steering and bias-ply tires, but the radial-tuned system was included when the automatic transmission was ordered, earning the Monte Carlo S label. A new model for 1973 was the Monte Carlo Landau, which was basically an "S" with a rear quarter Landau vinyl roof, Turbine II wheels and driver and passenger-side sport mirrors. The interior of the 1973 Monte Carlo featured an all-new, wraparound cockpit-style instrument panel, similar to that found in some contemporary Pontiacs, Oldsmobiles and Buicks, in which gauges and various instruments were centered within easy reach of the driver. The simulated burl elm trim was retained. A split bench seat was standard, but "Strato Bucket" seats of a new design were optional, along with a floor console featuring an equally new shifter with knob and button similar to Pontiac's Rally Sports Shifter replacing the Buick-like horseshoe shifter of previous years, and storage compartment. The bucket seats were of a one-piece high-back design with built-in headrests, and could swivel some 90 degrees to permit the driver and front passenger easier entry and exit. Cloth and vinyl trims were offered with both the bench and bucket seats. The standard engine was a 145 (net) hp (108 kW) 350 CID (5.7 L) Turbo-Fire V8. Optional engines included a 175 (net) hp (30 kW) 350 CID V8 with a four-barrel carburetor and a four-barrel carbureted 454 CID Turbo-Jet V8 rated at 245 (net) hp (183 kW). The 1973 Monte Carlo was named Motor Trend's "Car of the Year", due to its new styling and emphasis on Euro-style ride and handling. The 1973 Monte Carlo set a new sales record for Chevrolet, with nearly 250,000 sold for the model year. The success of the Monte Carlo and Pontiac's similar Grand Prix led to several new personal luxury cars from competitors, including subsequent Mercury Cougar, the Ford Gran Torino Elite, the Chrysler Cordoba and restyled Dodge Charger, and even high-line versions of the AMC Matador, which got a swoopy new coupe design for 1974. The 1974 Monte Carlo received minor detail changes from its 1973 predecessor, most notably a revised egg-crate grille in the front, flush mount taillights (no longer recessed with horizontal chrome bars), a shorter trunk deck that housed the relocated license plate and the trunk lock mechanism. In 1973 the trunk lock was below the trunk deck and above the rear bumper in a space that no longer existed on the 1974. A larger 5 mph (8.0 km/h) rear bumper was added, and in the interior the driver and passenger door map pockets were no longer available. The base Monte Carlo with manual transmission, standard suspension and bias-ply tires was discontinued, leaving only the "S" and "Landau" models equipped with radial-ply tires and upgraded suspensions along with standard power steering and front disc brakes. A three-speed manual transmission was listed as standard equipment on 1974 "S" and "Landau" models equipped with the standard 350 CID V8, and an automatic transmission was a required option with the larger 400 and 454 CID V8s. However, a number of sources indicate that Chevrolet built virtually all 1974 Monte Carlos with the Turbo Hydra-Matic transmission. The standard 350 CID Turbo-Fire V8 was again rated at 145 hp (108 kW) with two-barrel carburetor in 49 states. For Californians, the standard engine was a 350 Turbo-Fire V8 with a four-barrel carburetor rated at 160 hp (120 kW) that was not offered in the other 49 states. Reappearing on the Monte's option list for the first time since 1970 was a 400 CID Turbo-Fire small block V8 rated at 150 hp (110 kW) with a two-barrel carburetor (not offered in California) or 180 hp (134 kW) with a four-barrel carburetor. The top engine was again the 454 CID Turbo-Jet big block V8 rated at 235 hp (183 kW). Despite the Arab Oil Embargo of late 1973 and early 1974 that greatly cut into sales of standard and intermediate-sized cars in favor of smaller compacts and imported subcompacts, the Monte Carlo went the other way on the sales charts by setting a new sales record this year of over 300,000 units despite the long lines at gas stations and record-high gasoline prices. The Monte Carlo continued to lead in intermediate personal luxury car sales with the Grand Prix placing second and the arrival of new competitors this year, including an upsized Mercury Cougar, Ford Gran Torino Elite and AMC's Matador coupe. Chrysler would introduce its entries in this field for 1975 including the Chrysler Cordoba and redesigned Dodge Charger. The 1975 Monte Carlo received only minor styling changes from the 1974 model, including a new grille with the Monte Carlo emblem moved to the center section and new vertically shaped taillights with horizontal louvers. All models received catalytic converters to meet the latest federal and California emission requirements that included bonuses such as improved fuel economy and drivability, along with longer spark plug and muffler life, but required more expensive and lower-octane unleaded gasoline. Engines were carryover from 1974 except for the addition of GM's High Energy electronic ignition being made standard equipment. However, power ratings for all engines were decreased due to the addition of the catalytic converter. The 454 CID V8 no longer offered on California cars, leaving the 400 CID four-barrel the top engine in the Golden State. The base 350 CID two-barrel was rated at 145 hp (108 kW) (standard in 49 states), the 350 CID 4-barrel was rated at 155 hp (116 kW) (available only in California), the 400 CID 4-barrel 175 hp (130 kW), and the 454 CID 4-barrel 215 hp (160 kW) (now equipped with single exhaust with dual exhaust as an option). A three-speed manual transmission was standard equipment with the base 350 CID V8 used in 49 states and California-only 350 four-barrel V8. The Turbo Hydra-Matic optional and a required option for the 400 and 454 V8s. Chevrolet sources, however, report that virtually all 1975 Monte Carlos were equipped with the Turbo Hydra-Matic transmission, which became standard equipment for 1976. New for 1975 was a Custom interior option that included a plusher cloth 50/50 bench seat with recliner on passenger side and lower door panel carpeting. The standard interior still consisted of a bench seat with knit-cloth and vinyl or all-vinyl upholstery. The swiveling Strato bucket seats plus console and floor shifter were still optional with knit cloth or vinyl upholstery. Also, white all-vinyl interiors were available for the first time this year with either bench or bucket seats with contrasting colors for carpeting and instrument panels including black, red, blue and green. A gauge that showed if one was using too much gas, a part of the "Economider" Gauge package, became optional. Sales dropped off a bit from 1974's record-setting pace due to higher prices resulting from the addition of the catalytic converter, double-digit inflation and new competition from Chrysler's Cordoba and Dodge's Charger SE. Monte Carlo production ended up at around 250,000 units but would rebound to set a new record in 1976. A new crosshatch grille and vertically mounted rectangular headlamps, along with reshaped taillights identified the 1976 Monte Carlo (the reshaped taillight pattern was later incorporated into the fourth generation Monte Carlo). Under the hood, a new 140 hp (104 kW) 305 CID 2-barrel V8 became the standard engine with the 145 hp (108 kW) 350 2-barrel V8 and 175 hp (130 kW) 400 CID V8 both optional. California cars got a 165 hp (123 kW) 350 4-barrel as the base engine (not available in 49 states), and could be equipped with the 400 4-barrel V8. The big-block 454 CID V8 was discontinued from the option list this year. The Turbo Hydramatic transmission became standard equipment on all 1976 Monte Carlos. Interior trims remained the same as 1975 with both base and Custom levels, but the instrument panel and steering wheel featured a new rosewood trim replacing the burled elm of previous years. A new option was a two-toned "Fashion Tone" paint combination. Monte Carlo sales hit an all-time record with production of 353,272 units this year. 191,370 "S" Coupes were made. 161,902 Landau Coupes which were $293 more. A revised grille with smaller segments with the Monte Carlo "knight's crest" emblem moved to a stand-up hood ornament and revised taillight lenses marked the 1977 Monte Carlo, which was the last year for the 1973-vintage design before the introduction of a downsized 1978 Monte Carlo. Engine offerings were reduced to two engines for 1977. The base engine for 49 states was the 140 hp (100 kW) 305 CID 2-barrel V8 and the 170 hp (130 kW) 350 4-barrel V8 was optional (standard in California). The 400-cubic-inch V8 was dropped as an engine option. The Turbo Hydra-matic transmission was included standard equipment. Interior trim received only minor revisions this year with upholstery choices including cloth, velour and vinyl in both base and Custom trims. Swivel out seats and 8-track were optional. This model year marks the only time in history when an intermediate model was larger in every dimension than a full-sized model, as the B-body Chevrolet Caprice/Impala had already been redesigned and downsized for 1977. The Monte Carlo also weighed more. In 1977 sales totaled 224,327 S coupes and 186,711 Landau coupes. All GM intermediate-sized cars including the Monte Carlo were downsized for the 1978 model year in response to the 1973 Arab Oil Embargo and CAFE requirements. The 1978 model was 700-800 lb lighter and some 15 inches shorter than the 1977 model. The 1978 model also had more interior and trunk space than the earlier 1977 model. The engines offered in previous years were dropped in favor of a standard 231 CID V6 built by Buick or an optional Chevrolet 305 CID V8. New one-piece wall-to-wall carpeting was standard. The three-speed manual transmission reappeared for the first time in several years as standard equipment on the base model with the V6 engine, and the automatic was optional. The optional V8 and all Landau models came standard with the automatic. A four-speed manual transmission with floor shifter was optional with the 305 V8, the first time a four-speed manual was offered on the Monte Carlo since 1971. Only minor trim changes were made to the 1979 Monte Carlo which included a restyled grille, revised parking lamp detail and new wrap-around taillamps. Mechanical changes included a new Chevrolet-built 200 CID V6 (the ancestor of the Vortec 4300) as the standard engine for the base Monte Carlo in 49 states while the Buick 231 CID V6 remained standard on base models in California and all Landau models. A new 125 hp (93 kW) 267 CID V8 became optional and the 140 hp (100 kW) 305 CID V8 continued as an option but was joined by a 160 hp 235 lbf⋅ft (319 N⋅m) version with a four-barrel carburetor. The same transmissions were carried over from 1978, including a standard three-speed manual and optional four-speed manual, or an optional three-speed Turbo Hydramatic automatic. This would be the last year that Chevrolet would offer manual transmissions on the Monte Carlo due to extremely low buyer interest. A black 1979 Monte Carlo was used by Michael Platt and William Matix during the 1986 FBI Miami shootout. A 1979 Monte Carlo modified to a lowrider, was also heavily featured in the 2001 movie Training Day. The car was driven by the main character Detective Alonzo Harris, played by actor Denzel Washington. For 1980, the car received a mild frontal restyle, with quad headlights and turn indicators mounted beneath. The metric 200 3-speed automatic transmission became standard on all models and a new Chevrolet-built 229 CID V6 with 2-barrel Rochester carburetor replaced both the 200 CID V6 of 1979 and the Buick engine offered on all 1978 models and the 1979 Landau as the standard engine in 49 states (California cars still got the Buick engine). A new option for 1980 was Buick's turbocharged version of the 231 CID V6 rated at 170 hp (130 kW). Other optional engines included 267 and 305 CID versions of the Chevrolet small-block V8 with up to 155 hp (116 kW). Front head room was 37.6 inches, while rear head room was a little bigger, at 37.8 inches. A power trunk opener was still optional. There were a total of 13,839 turbo Monte Carlo's for 1980. A new 14" rally wheel option was introduced with 5 slots (with squared ends and a pointed edge) – later shared with subsequent Chevrolet/GMC A/G-bodies including the Chevrolet S10 light duty truck. The body was restyled with the other GM mid-size formal coupes (Oldsmobile Cutlass Supreme, Pontiac Grand Prix, Buick Regal). It featured a smoother profile than the previous models and new vertical taillights similar to the 1973–1977 models. Engine offerings were carried over, including the standard 229 CID Chevrolet V6 (231 CID Buick V6 in California) an optional 267 CID V8 (not available in California), a 305 CID V8 in the base and Landau models, and a turbocharged 170 hp (130 kW) 231 CID Buick V6 in the Monte Carlo Turbo. There were a total of 3,027 Monte Carlo Turbos for 1981. The Monte Carlo Turbo appeared slightly different from other Monte Carlos that year because in addition to the turbo motor it also was equipped with a small hood scoop on the left side of the hood. It also had Turbo 3.8 badges with Chevrolet bowtie on the sides of the hood scoop, on the trunk lid, and on the right side of the dash. An automatic transmission, power steering and power front disc brakes were standard equipment. While this car was considered by some to be much better looking (and appeared more aerodynamic) than its Buick Regal, Pontiac Grand Prix, and Olds Cutlass cousins, only one team tried to make a go of it in NASCAR cup racing. While the big Monte Carlo was the dominant body style in the late 1970s, winning 30 or so races, the downsized (and cleaned-up) 1981 body would only take two checkered flags in the 1981 and 1982 seasons when it was run. Few revisions were made on the 1982 Monte Carlo. All engines, except for the turbocharged 231 CID V6, which was discontinued along with the Monte Carlo Turbo model, were carried over from 1981. New for 1982 were the additions of a 260 CID V6 and an Oldsmobile 350 CID V8, both of which were diesel engines. With the introduction of GM's new mid-size platform that saw the introduction of the Buick Century, Chevrolet Celebrity, Oldsmobile Cutlass Ciera and Pontiac 6000, the chassis designations were shuffled up. The new mid-size cars were designated as A-body cars, whereas the cars previously designated as A-bodies were now called G-bodies. A black exterior was not offered in 1982 and also not available in 1982 for the first time in Monte Carlo history was a sportier interior option with Strato bucket seats and console, as only the standard notchback bench or optional 55/45 bench were offered this year. Weight distribution was 57% in the front and 43% in the rear. For 1985, T-tops were re-introduced because it had been discontinued after the 1983 model year and additional SS colors (Black, maroon and silver in addition to white), pinstriping, and options were made available. The (later to be highly sought after) medium blue ("gun metal") color for the SS was dropped. A four-speed automatic overdrive transmission, the Turbo Hydramatic 200-4R, with a revised sport rear axle ratio containing 3.73:1 gears became standard on the SS. Gone for good were the 229 CID V6 and 350 CID V8 diesel engines. Introduced in place of the 229 CID V6 was a 262 CID (4.3 L) V6 (RPO LB4) that was fuel-injected with throttle-body fuel injection. The V-8's were fitted with computer controlled Quadrajet carburetors. The 1985 Chevrolet Monte Carlo, Chevy's rear-wheel-drive personal-luxury car, got more power, but for the first time since 1981, no diesel engine was offered in the Monte Carlo. On the base model, the previously standard 3.8 L Chevy V-6 gave way to a larger 4.3 L V-6 with throttle-body fuel injection. That brought along 20 extra horsepower, for a new total of 130. The optional 5.0 L V8 likewise gained some horsepower, via a jump in compression ratio. It jumped from 150 horsepower to 165. The High Output 5.0 L V8 in the 1985 Chevrolet Monte Carlo SS remained at 180 horsepower. 10.5-inch front disc brakes were standard. A/C was $730. The V-6 and base V8 could be backed by either a three- or four-speed automatic transmission, but the H.O. V8 in the SS came only with the four-speed automatic this year. Though the base coupe carried on visually unchanged, the SS was a different story. Previously offered only in white or dark blue metallic, color choices were expanded to include silver, maroon, and black. "Removable glass roof panels" (T-tops) came on board as a midyear option. Nearly 120,000 Monte Carlos found eager buyers in 1985. Though the total was down somewhat from 1984, the SS model saw sales climb from 24,050 to 35,484, a sure sign that performance was making a comeback. The 1985 Monte Carlo SS also came stock with a 35 millimeter sway bar which added extra support for the high-performance rear end. In 1987, Chevrolet eliminated the Sport Coupe version of the Monte Carlo, leaving the LS, SS, and Aerocoupe. The Super Sport incorporated the "smoothed" rear bumper and tail lamps first introduced on the 1986 Luxury Sport and midway through the production year introduced the "lay-down" spoiler. The Aerocoupe made up 6,052 of the 39,251 total Super Sports that were produced that year. 39,794 Luxury Sports were produced in 1987. 1988 was the last year for the fourth-generation Monte Carlo. The 1988 models were actually built in late 1987, with only 16,204 SSs made for an asking price of US$19,320. Appearance and mechanicals were similar to the 1987 model. The 1988 model only came with the lay-down style spoiler, unlike the 1987 model, which came with either the lay-down or stand-up type spoiler. The Aerocoupe did not return, as Chevrolet had unveiled plans to produce the Lumina and race that body style in NASCAR. The new Lumina body style was much more aerodynamic and negated the need for a "sleeker" version of the Monte Carlo SS. The Lumina coupe was introduced as a 1990 model to replace the Monte Carlo. Total production numbers for the final year of the rear-wheel drive Monte Carlo was 30,174 — almost half of the 1987 numbers. The final G-body Monte Carlo – a silver SS coupe — was produced on December 12, 1987 which rolled off the GM Arlington Assembly plant. Total SS production for '88 was 16,204. 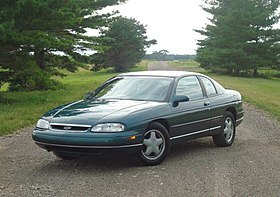 For the 1995 model year, the mid-size Lumina was split into two models with the sedan continuing as the Lumina and the coupe reviving the Monte Carlo nameplate for its fifth generation. The new car rode on an updated W-body chassis shared with the Lumina, Pontiac Grand Prix, Oldsmobile Cutlass Supreme, Oldsmobile Intrigue, Buick Century and Buick Regal, and by its nature was the first front-wheel drive Monte Carlo. For 1995, the LS was $16,770 and the Z34 was $18,970. All 1995–2007 Monte Carlos were built in Oshawa, Ontario, Canada from February 14, 1994 to September 1999. Unlike Monte Carlos of previous years, the distinctive bulges to the front fenders and rear quarter panels were gone. A special run of 400 1995 Z34s were made called the Monte Carlo Brickyard 400 Pace Car. The $2195 option included interior ornamentation, embroidered leather 45/55 seating with full floor console, an aero wing spoiler, and an accent stripe package. Throughout these five model years, the Monte Carlo was available in two trims, the LS and the Z34. Appearances were largely identical between the two models. Styling changes consisted mainly of the special red-colored badging, a lower front air dam, and blacked out trim on the Z34, the real difference being under the hood. LS models were powered by the 3.1 L 3100 V6 putting out 160 hp (120 kW) at 5200 rpm (119 kW) and 185 lb·ft (251 Nm) while Z34's featured a more powerful 3.4 L DOHC V6 engine with 215 hp (160 kW) and 220 lb·ft (298 Nm). Aside from minor equipment changes, the fifth generation remained virtually unchanged during its run. In 1998, the 3.4 L was replaced with the 3800 Series II which cranked out 200 hp and 225 lb·ft of torque. All Z34 models came with 16-inch alloy wheels, optional on LS models in place of the standard 15-inch steel wheels with bolt-on wheel covers. 1998–1999 Z34 models received redesigned 16-inch wheels, though the previous-style Z34 alloys remained on the LS. 1997 models added daytime running lights as standard to the standard dual airbags and ABS. Rear visibility was poor. Also, again Chevrolet made a limited production run of Monte Carlo Brickyard 400 pace cars, though none were available for consumers. This generation of the Monte Carlo was the last 2-door non-truck vehicle featuring 6-passenger seating, although bucket seats were available as an option with a floor-mounted shifter. Though derided by some for its indistinct lines (called the 'Lumina Carlo') and its front-wheel drive drivetrain, the fifth generation sold well enough for Chevrolet to continue the line with a more original redesign in 2000. For 2000, Chevrolet not only again called upon GM Motorsports for design inspiration, but also to Monte Carlos of the past. Among the traits carried over from older Monte Carlos were the stylized wheel flares, vertically oriented tail lamps, and a stylized rear bumper. Another classic trait for 2000 was the return of the "knight" badging, as well as a full gauge cluster, not seen on the Monte Carlo since 1988. Back again was the Super Sport moniker, replacing the Z34 designation of the fifth generation, which was a Lumina Coupe legacy. Chevrolet also retired the Lumina name, bringing back the Impala nameplate for the Monte Carlo's sedan counterpart. At the request of racing teams, Chevrolet stylists added a slight "hump" on the rear trunk – similar to, although smaller than, a Lincoln Mark VIII. It was a distinct trait that stayed with Monte Carlo until its demise, even though later in the generation every trim level would get a spoiler that all but masked the hump. From the NASCAR circuit came the aerodynamic styling and duck tail spoiler. The 6th generation Monte Carlo is based on the Monte Carlo "Intimidator" concept car, produced in 1997. Trim levels initially consisted of the LS, and SS, the latter being the first front-wheel drive SS in the Chevrolet lineup. The LS used a 3.4 L OHV V6, while the SS got the 3.8 L V6. A Supercharged SS model was added for 2004 and 2005, though the naturally aspirated SS continued as well, but was relabeled as LT.
Chevrolet released several models inspired by then-current NASCAR drivers: The first model released was the 2002 Dale Earnhardt Signature Edition, also referred to as Intimidator Edition. This car had two color schemes; a black body with galaxy silver rocker panels and front and rear air dams, and an all black body with black ground effects. A thin red stripe above the silver ground effects was also included. Just behind the rear side windows, the Dale Number 3 logo was placed with Earnhardt's signature below the Number 3 logo. The car also featured silver "Intimidator" SS badges on the right side of the trunk and standard Monte Carlo SS badges the bottom of the vehicle, just in front of the rear tires. An Intimidator badge with the number 3 also appeared on the dash, and Earnhardt’s signature appeared on the gauge cluster. The interior is all black ("charcoal") leather. This edition also came with 5 spoke, diamond cut wheels and received GMs L36 3800 V6 engine. In 2003, the Jeff Gordon edition was released. The vehicle came with a superior blue body and silver ground effects, just like the Intimidator Edition; however, the Jeff Gordon edition also received lighter blue ghost flames on the body. It featured the number 24 behind the rear side windows. A Jeff Gordon signature was placed on the right side of the trunk and inside the car received a Jeff Gordon badge on the dash board and a two-tone gray a black leather-wrapped steering wheel and shift knob. It featured the 5 spoke, diamond cut wheels and received GMs L36 3800 V6 engine. In 2004 the Dale Jr. Edition came out, it was red in color and sported a black high sport kit. The number 8, with an “E” stripe design carried from the doors to the rear bumper. The 5 spoke diamond cut wheels featured a black stripe through each spoke and Dale Jr.'s signature appeared on the right side of the trunk lid. On the sides, the vehicle received Supercharged SS badges. Inside on the dash a #8 badge appeared and Dale Jr.'s signature on the cluster. This edition also got #8 floor mats and headrests. This was also the first nameplate car to receive GMs L67 Supercharged 3800 V6 engine. They changed the fan speed for heat and air conditioning this year. previous years had 1-5 settings. Monte Carlo will now come with 10 dots to mark your fan speed. To compete, the Intimidator Edition was re-released in 2004, this time, however the vehicle featured "Intimidator" badges on the trunk lid and both side panels of the vehicle. The car was all black in color, received the 5 spoke, diamond cut wheels and this time received GMs L67 Supercharged 3800 V6 engine. 2005 marked the next and final nameplate, the Tony Stewart edition. It was all black, but featured a white/orange line that thickened as it reached the back of the vehicle and contained number 20 just before the rear tires. Tony Stewart’s signature also appeared behind the rear windows on both sides. The Chevy bowtie on the trunk was white on this edition and another was painted on the front of the hood. The Monte Carlo badge was removed and instead replaced by the black Tony Stewart grille. The wheels were the same design as the Dale Jr. Edition, except the bowtie on the center cap was white this time. This edition also received GMs L67 Supercharged 3800 V6 engine. General Motors released several Monte Carlos branded as "Pace Car" replicas. Each year featured a different color and all cars were limited to production numbers, however; all cars did have some things in common. All pace cars received: Galaxy Silver ground effects, checkered flagging on fenders & doors, "Tasmanian Devil" decals on quarter panels and trunk lid behind the "Monte Carlo" script. It also has a "race inspired" rear spoiler that resembles the look of the NASCAR spoiler, limited edition plaque on trunk lid, "Monte Carlo" script on the dash is replaced with "PACE CAR", Gauge cluster displays "LIMITED EDITION" below the speedometer where it would say "Apply Brake To Shift From Park," 16-inch diamond-cut cast-aluminum wheels, door opening kick plates featuring the Monte Carlo nameplate, and stainless-steel dual exhaust tips. Interiors had two tone leather in 2000 through 2002 to match exterior with 2003 being solid black and Chevy "bow tie" embroidered headrests. All cars also came with GMs L36 3800 V6 engine. Production limited to 2,222 cars. Sports two-tone leather black and red. Exterior: Torch Red with Galaxy Silver ground effects. Production limited to 1,300 cars. Sports two-tone leather black and silver. Exterior: Black with Galaxy Silver ground effects. Production limited to 1,150 cars. Sports two-tone leather black and yellow. Exterior: Competition Yellow with Galaxy Silver ground effects. Production limited to 1,401 cars. Sports leather Ebony Black seats with ebony and gray leather-wrapped steering wheel. Exterior: Superior Blue Metallic with Galaxy Silver ground effects. The facelifted 2006 Monte Carlo and the companion Impala sedan were introduced at the 2005 Los Angeles Auto Show. The base engine was a 3.5 L V6 producing 211 hp (156 kW). Trim series for this generation include the entry level LS, the mid level LT, the upper level LTZ and, the top of the line SS. Only 14,829 SS models were produced over the two years, 8,794 in 2006 and 6,035 in 2007. The most notable news, though, was the SS model's use of the generation IV small-block V8 — the first V8 since the 1988 model. The 5.3 L V8 produced 303 hp (226 kW). The interior for 2006 was mildly redesigned. The revised model also adds an improved interior with expanded Driver Information Center (DIC), enhanced ABS and traction control, as well as optional, seat-mounted side air bags for the front driver and passenger. A few Internet Discussion Forums describe the 2006–2007 model refresh as a Seventh Generation of the Monte Carlo. They cite the body panel updates, engine availability options, and interior changes as significant enough to warrant a change, while admitting that even GM considers those years part of the Sixth Generation. There are other makes and models of automobiles that have made similar changes, while staying within the same generation (ex. the Fourth Generation Chevrolet Camaro, and even the earlier Second Generation of the Monte Carlo). LS-LT 2006–2007 3.5 L LZE V6 211 hp (157 kW) 214 lb⋅ft (290 N⋅m) 4T65E ?? 3.9 L LZ9 V6 (2006 only) 242 hp (180 kW) 242 lb⋅ft (328 N⋅m) 4T65E ?? The LT and LTZ model were available with the 3.9 L engine in 2006. For 2007 the LTZ model was dropped along with the engine in favor of utilizing the Flex Fuel 3.5 L as the exclusive engine for non-SS models. The Monte Carlo ceased production at Oshawa Car Assembly Plant #1 on June 19, 2007, following an announcement in February 2007 of its demise. General Motors has released this statement: On Tuesday, June 19, 2007, the last two 2007 Chevrolet Monte Carlo models rolled off the line at the Oshawa Assembly Plant. The last two models were identical "SS" models with Precision Red exterior paint; Silver Rally Stripes; and Ebony Nuance leather interior. The two models features the "SS" 5.3 L V8 engine rated 303 hp (226 kW); 18-inch polished aluminum wheels; heated exterior mirrors; as well as an AM/FM/CD and XM Radio. The vehicle was discontinued due to declining sales in coupes in general and the company's plans to revive the Chevrolet Camaro, which would cannibalize sales of the Monte Carlo. The final Monte Carlo off the production line was retained by GM for their Heritage Center collection. The second-to-last Monte off the line, the last "saleable" unit, was auctioned off on August 15, at Manheim's Statesville Auto Auction in Statesville, North Carolina. The winning bid went to Fred Simon, owner of Simon Chevrolet in Woonsocket, RI where it is on display on the dealership floor. This unit was at the Indianapolis Motor Speedway over the weekend of July 27–29 for the 2007 Allstate 400 at the Brickyard. While there, it was signed by all the current Team Chevrolet drivers who were active in the NASCAR Sprint Cup Series. Chevrolet Monte Carlo painted to look like a stock car (in this case, the #29 car, driven by Kevin Harvick). From 1972 until the car's end of production in 1988, the Monte Carlo was campaigned in NASCAR racing. The 1973–1977 cars were the dominant body style through the years until 1980, when NASCAR mandated a move to the shorter 110-inch (2,794 mm) wheelbase cars being built by Detroit. The 1981 and 1982 (referred to as the "flat-nose") Monte Carlo was raced by few teams and only won two races in those years. In 1983, the addition of the SS nose became the Monte Carlo body style used in NASCAR until the car went out of production. The Monte Carlo returned for the 1995 season with the fifth-generation body, but NASCAR allowed the car to have wider rear quarter panels, and as such deviated from factory sheetmetal, that up until that time the race spec cars had to use. The 1995 bodystyle was also a favorite on the NASCAR circuit and enjoyed considerable success at the track. The car captured several NASCAR Manufacturers Cup awards until it again was discontinued from production in 2007, and replaced by the Impala for racing. ^ Gunnell, John A. (ed.). Standard Catalog of American Cars 1946–1975. Krause Publications. ISBN 0-87341-027-0. ^ "1972 Chevrolet Monte Carlo brochure". Oldcarbrochures.com. Retrieved June 1, 2012. ^ "1970 Chevrolet Monte Carlo brochure". Oldcarbrochures.com. Retrieved June 1, 2012. ^ "Behind the Badge: Cryptic Origins of Monte Carlo's Red Knight's Crest | The News Wheel". TheNewsWheel.com. Retrieved June 5, 2017. ^ Magazines, Hearst (April 1, 1970). "Popular Mechanics". Hearst Magazines – via Google Books. ^ "1971 Chevrolet Monte Carlo brochure". Oldcarbrochures.com. Retrieved June 1, 2012. ^ a b c "1977 Chevrolet Monte Carlo brochure". Oldcarbrochures.com. Retrieved June 1, 2012. ^ a b c "1974 Chevrolet Monte Carlo brochure". Oldcarbrochures.com. Retrieved June 1, 2012. ^ a b Gunnell, John A. (ed.). Standard Catalog of American Cars 1946–1975. Krause Publications. ISBN 0-87341-027-0. ^ "1975 Chevrolet Monte Carlo brochure". Oldcarbrochures.com. Retrieved June 1, 2012. ^ "1976 Chevrolet Monte Carlo brochure". Oldcarbrochures.com. Retrieved June 1, 2012. ^ a b c Auto Editors of Consumer Guide (July 31, 2007). "1977 Chevrolet Monte Carlo". Auto.howstuffworks.com. Retrieved April 30, 2015. ^ "1977 Chevrolet Monte Carlo brochure". Oldcarbrochures.org. p. 6. Retrieved April 30, 2015. ^ a b "1978 Chevrolet Monte Carlo brochure". Oldcarbrochures.com. Retrieved April 30, 2015. ^ a b c 1980 Chevrolet Monte Carlo Brochure. GM. 1980. Retrieved June 16, 2015. ^ a b World Cars 1982. Herald Books. ISBN 0-910714-14-2. ^ a b c World Cars 1985. Herald Books. 1985. ISBN 0-910714-17-7. ^ 1984 Monte Carlo Brochure. Oldcarbrochures.com. Retrieved June 16, 2015. ^ a b Gunnell, John (2007). standard catalog of American Muscle Cars 1973–2006. krause publications. ISBN 978-0-89689-490-7. ^ a b "1997 Chevrolet Monte Carlo Reviews – Cars.com". Cars.com. ^ "1997 Chevrolet Monte Carlo Reviews – Cars.com". Cars.com. ^ Newbury, Stephen. The Car Design Yearbook 4. Merrell. ^ "Monte Carlo production to end". Left Lane News. March 1, 2007. Retrieved March 1, 2007. ^ "GM Online Auction: News". General Motors. August 2007. Archived from the original on February 19, 2007. Retrieved August 15, 2007. Wikimedia Commons has media related to Chevrolet Monte Carlo.